Well, last week we almost started a new message series. It was the first Sunday of the new year, and so we started off by talking about how we spend our time. We certainly live in a time when the days are indeed evil, but we can redeem or buy back that time from evil and use it for good. So Paul is encouraging us in this verse to make the most of every opportunity we have for the kingdom of God. And we ended last week on the point that we spend way more time at home than we ever will at church. To go along with those other statistics that we shared, the average life expectancy of a typical North American is about 28,835 days (just under 79 years) – and we will only spend about 173 of those days attending church. That’s 28,662 days not at church. So by far, the majority of our opportunities to ‘redeeming the time’ will not be happening at church – it will be happening within our own homes. But that doesn’t mean the church will not be involved. One of the points that I try to bring out in the kids features every so often – is that the church is not a building or an event – the church is actually the people in the building or at the event. Specifically, it’s the people who have put their trust in Jesus and have been adopted into the family of God. But we don’t often communicate that to our kids very well. Do you see why this can be confusing? Judging by those four statements, the church is an event, it’s a building, it’s a social status, and it’s a type of clothing. “But while Peter was in prison, the church prayed very earnestly for him.” Acts 12:5? In those verses, church doesn’t sound like an event, a building, a social status, or a type of clothing. Look at the action verbs there – Praying, deciding, reading – those all sound like things that people do. Building don’t pray. Events don’t read. People do these things. So it’s pretty clear that the church is people – people who have been adopted into the family of God. You and I are the church. Your kids (if they’ve made decision to follow Christ) are the church. And we’re not just the church on Sunday mornings. We’re not just the church for 173 days of our lives. We are the church 24/7 – 365 days a year. When you go home for lunch today – you will still be the church. When you watch the hockey game tonight, you will still be the church. When you go to work tomorrow morning, you will still be the church. And I think most of us understand that – but how well do we live like that? You see – I think for the most part, we do a pretty good job of being the church at church. When I come here Sunday mornings, it seems that everyone is playing their part well. No one’s cussing or swearing, no one’s yelling at their kids, no one’s fighting with their wife – we’re all smiles and singing those worship songs, praising Jesus, reading our Bibles, and encouraging one another over coffee and snacks. It’s really great! I think that’s what the church should look like. But is that what “church” looks like when you go home? Does the church in your house look the same as the church that meets in this hall? And that’s really the issue that we want to look at over the next few weeks. 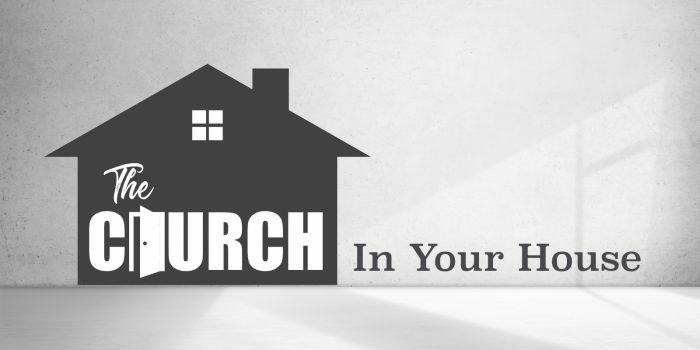 We want to look at the church in your house. Because regardless of what role you play in this church that meets in this hall – you will have a much greater role in the church that lives in your house. Your influence and the impact you make on those in your own home will likely be the most influence and greatest impact you will have in your life. I mentioned earlier that you spend about 173 days of your life attending church – you could double that, triple that – or even multiply that time by ten – and you’re still no where close to the amount of time you spend in your house with your family. If we’re going to get Christianity right – we’ve got to get it right in our own homes. So that’s what we’re going to talk about for the next few weeks. Well, I told you that we were going to finish up that chapter today because as Paul writes that chapter, he ends by really shining the spotlight on what it means to be the church at home. So let me just read the last few verses we looked at last week just to refresh our memory and to set the stage – and then we’ll carry on with the rest of the chapter. Ok, so that sets the stage. We are not to live like fools – but like those who are wise. We are to understand what the Lord wants us to do – not just once a week for an hour at church – but 24/7. We are to make the most of EVERY opportunity. When we spend all that time at home or at work, we are to be filled with the Holy Spirit – singing songs of praise and giving thanks to God for everything! It sounds like Paul wants us to have a worship service everywhere we go! Just crank up Shine FM and sing along throughout the day. I know Allison would have no problem with that! But then Paul goes on to explain that it looks like to live wisely and make the most of every opportunity when it comes to our relationships with one another – specifically in this chapter the relationships between husbands and wives…. Now I realize that is a lot to take in – but this is the foundation for everything we’re going to be talking about for the next few weeks, so it’s important that we wrap our heads around all this. According to this passage, our marriage relationships are a model of the relationship between Christ and the church. I know most of us got distracted by all the whole ‘wives, submit to your husbands, and husbands love your wives like Christ loves the church’… That’s usually the part we focus on – but it’s important that we don’t miss this other part about how marriage is a reflection of Christ’s relationship with the church. Did you catch that part? This is very significant. It’s like we are a visual aid or living example of how God relates to us and how we are to relate to him. The relationship between husband and wife is to mimic the relationship between Christ and the church. I was at a wedding a few year ago and the minister doing the ceremony said that marriage is kinda like a skit. It’s like we’re doing a play where the husbands are playing the part of Jesus and the wives are playing the part of the church. That’s really what’s going on here. The way we interact with each other in marriage is supposed to show the rest of the world how God interacts with us. Our marriages are designed to illustrate love, unity, joy, compassion, forgiveness, faithfulness and all that stuff. In other words, even if our friends and family never ever read the Bible, our marriages should show them what God is like. Does your marriage do that? Husbands, does the way you interact with your wife illustrate what God is like? Wives, does the way you interact with your husband illustrate how God wants us to interact with Him? Could people look at your marriage – at your relationship – and get a good accurate picture of the relationship between God and his people? And I understand that both of those are very tall orders. Those are not easy things to do. But that’s the goal. That’s God’s design for marriage. I think it’s very important that we understand that marriage is an illustration of God’s relationship with us – especially when we try to understand our roles in marriage. For many people, when they read this passage and see that the husband is the head of the wife and that the wife is to submit to the husband – that just sets off all kinds of alarm bells in their minds. I think that’s because over the years, many people have abused this passage of Scripture and have twisted what it actually says to mean something else entirely. This is not a passage that gives a man permission to be abusive or bossy or domineering – you won’t find that in any Scriptures. This passage says that men are to be like Jesus and I’ve never heard Jesus being described as abusive, bossy, or domineering. So what is this passage saying? How are we to understand the roles of men and women in marriage? How are we to understand what it means for the husband to be the head of the wife and for the wife to submit to her husband? First of all, remember that we are playing the parts of Jesus and the church. The roles that God has given us in marriage do not define who we are – but rather what role we play in marriage. The roles that God has given us aren’t based on our abilities or our inclinations – and they don’t define who we are as people or how valuable we are or anything like that. But they are the roles we play in marriage. For example, the man is not necessarily more capable or more wise or more anything than his wife – in many cases I find that my wife is more capable and more wise than I am. But that doesn’t mean we change our roles. We work together – using the skills and abilities we both have in the roles that God has given us. I found a couple of definitions from John Piper that I think will help bring some clarity. Here are his definitions of Headship and Submission. Alright, now let’s just work through these for a minute. If marriage is a reflection of Christ and the church, how well do these definitions fit with that? Does Christ take primary responsibility for the leadership of the church? I should say so. I’m reminded of Matthew 16:18 where Jesus says to Peter “I will build my church, and all the powers of hell will not conquer it.” The person responsible for building the church was not Peter. It was not Paul. It’s not the pastor. It’s not the elders. Jesus Himself is the one primarily responsible for leading the church, building the church, and growing the church. It’s his church and he’s the one responsible for it. Likewise, Jesus protects and provides for his church. If you’ve ever looked at church history, that certainly becomes clear very quickly. There’s no way the church should have survived these 2000 years, but it has. And we’ve seen that even in our own local gathering here – God has always provided for us. So I think that definition of headship certainly fits what we see in Christ as the head of the church. Well then, how about that definition of submission? I’d say that fits pretty good too. We can certainly say that the church’s role is to honour and affirm Christ’s leadership in the church – in our lives and in the world. That’s kinda the point of making disciples – right? A disciple is someone who has affirmed that Jesus is Lord and wants to honour Him with their lives. And making disciples is one of the church’s main purposes on earth. So it’s most certainly our role to honour and affirm Christ’s leadership. In fact, sin, by definition, is when we reject God’s authority and refuse to submit to his leadership, so I think that definition fits quite well. And as for the second part of that definition, God has certainly invited us to join him in his redeeming work in the world – We’re not the ones primarily responsible for it (That’s Christ’s job) – but he’s invited us to help him with our unique gifts. There are several passages in the New Testament where it talks about how all believers all have different gifts and abilities that they can use to help build the church and further the kingdom of God. So I think these definitions of headship and submission fit quite well with Christ’s relationship with the church and are therefore good definitions for us as we model that in our marriages. So men, that means we are to take the primary responsibility for all that goes on in our homes – just like Christ takes primary responsibility for all that goes on in the church. And not because you’re more capable than your wife or anything like that – but because that’s the role God has given you. Certainly, your wife is an equal partner and she may have gifts and abilities that surpass your own in many areas of life and you need to make sure that you welcome her involvement in everything – but at the end of the day, the buck stops with you. If the dishes aren’t done – that’s ultimately your responsibility. If there is no money in the bank account – that’s ultimately your responsibility. If the kids have not been taught about Jesus – that’s ultimately your responsibility. The buck stops with you. That is the role that God has given you. Ladies, your responsibility in all this is to affirm and honour your husband’s leadership and to help him with the gifts and abilities that God has given you. And I know this isn’t always easy. Christ is perfect – and the church still struggles to follow Him well – so honouring and affirming your imperfect husband is not always going to be easy. I get that. But that’s the role that God has given you play. And here’s the good news, when you both take your roles seriously: When we men shoulder that responsibility – all while loving our wives with the same self-sacrificing love of Christ, and when you wives honour and affirm the leadership of your imperfect husband – when you both take on those roles – your home is going to flourish. God’s designed this marriage thing to work really well when we follow his design. And I know there is a lot more that could be said about all this – and next week, we are going dive a little deeper into these roles – specifically into the husband’s role… Ladies, you’re still welcome to come – but men – you’ve got to be here. This stuff is really important and it might just change your marriage for the better! But I do want to invite further conversation about all this. If you’ve got questions or concerns about some of this stuff, I’d be happy to have you over for a coffee (Or maybe you’d even want to talk with Heather and hear her perspective in all this) – that would be awesome – we would love to do that. We would love to see the marriages and the families in this church flourish. We want the church in your house to be that living model of Christ and his church.